Offering space for holistic nourishment and community! Our SuperCharge! 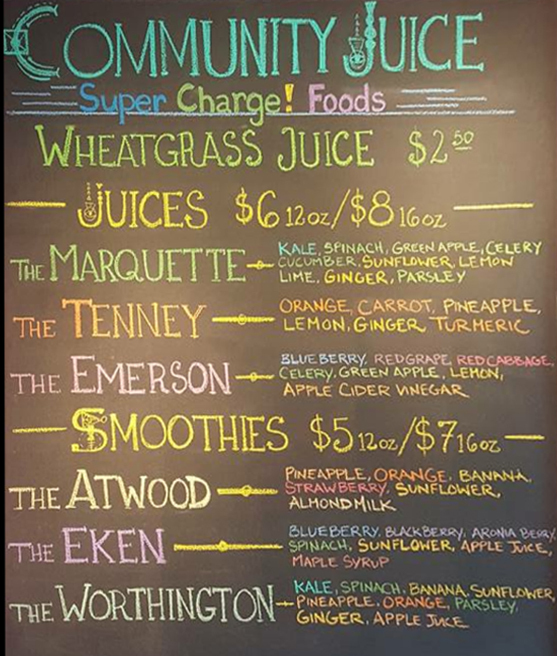 bar offers organic juices, smoothies, and teas specially formulated to SuperCharge! YOU! Located in front of the SuperCharge! Urban farm we are able to share the freshest 'farm to table' WheatGrass shots as well as our very own "SuperFood Salads" made from our home-grown MicroGreens! Yum Butter, Fizzeology, Let It Ride Cold-brewed coffee, NessAlla Kombucha, Tapuat Kombucha, Rude Brew Kombucha, Nami Chips, Paleo Mama products, Inspired Alchemy SuperFood Truffles, H2O EnergyFlow charged water, SuperCharge! MicroGreens & Salads, Gorilla Goods.